This month Rebecca Riordan looks at implementing a common business rule. In fact, she provides two methods for handling the common case of multiple prices for a given product, depending on the quantity ordered–the customer pays $1.79 each for buying up to nine items, but only $1.69 each when buying 10-14 items, and so on. I’ve always been impressed with the Northwind sample database. Yes, it’s true that it’s slightly artificial, and perhaps not all of the code is as efficient as it might be. But as a sample database bundled with a commercial product, it’s as close to a production application as you’re likely to get. 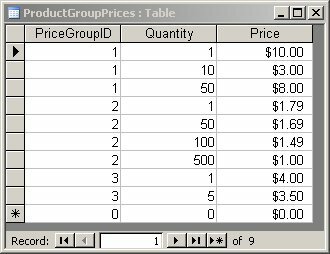 I truly wish I had a dollar for every person who’s learned the fundamentals of database design by adapting Northwind to their needs. But there’s one common situation that Northwind doesn’t address: multiple prices for a product, depending on the quantity purchased. This situation is common in any organization that typically sells multiple units of its products–hardware (who buys a single nail? ), paper goods, even lighting fixtures. But implementing a lookup against this structure is a nightmare. We’re all so spoiled by Access’ row fix-up (the mechanism by which Access will automatically look up the values on the many side of a relationship) that we expect related values to pop up automatically for us. With this design, however, you’ll find yourself writing ugly “Select Case quantity <= x And quantity > y” statements in the Exit event handler of an enormous number of form controls. Even if you’re more patient about writing If statements than I am, the structure shown in Figure 1 embeds the pricing structure of your business rule in the field names of your database. Trust me: Putting data in a field name is always a bad idea. The reason, of course, is that data changes, and before you know it you’ll be looking at the behemoth shown in Figure 2. Just look at all those zeros. And imagine what your If statement will start to look like: “If quantity <=x And quantity > y And rs.PriceXtoY > 0 Then…ElseIf…ElseIf…” I don’t care how much you get paid per hour; life is just way too short. I’m sure that it will come as no surprise to discover that the solution is to split the original table up. There are two ways to do this, depending on how much flexibility is required. The most flexible method is shown in Figure 3. The original table has been divided in two–a Products table and a ProductPrices table, with a one-to-many relationship joining the two. The Quantity field in this table contains the smallest quantity that qualifies for that price. 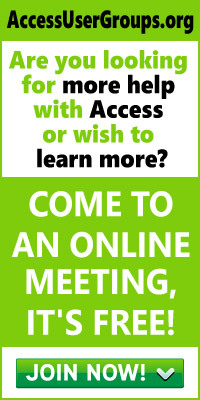 There’s no need to specify the top range (as Doug Steele demonstrates in this month’s “Access Answers” column). 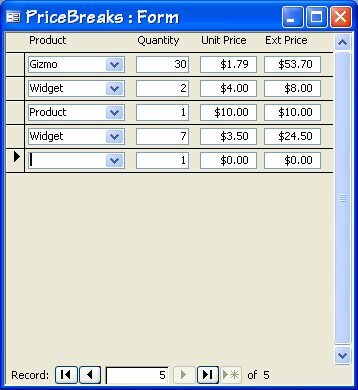 By the way, the ProductPrices table actually contains the ProductID field, and the primary key of the ProductPrices table consists of both the ProductID and Quantity fields. You don’t see the ProductID in my figure because Access hides the foreign key value when displaying sub-datasheets. The statement declares two parameters, theID and theQty, both Long Integers that will receive (respectively) the ProductID and the quantity entered on the form. The Where clause does the first part of the work, selecting rows that have the specified ProductID and a quantity less than or equal to the specified quantity. The Order clause sorts the rows in descending order of quantity, and the Select clause specifies that only the Top 1 row be returned. Combined, these two clauses mean that only the single row with the highest qualifying discount will be returned. Given the table shown in Figure 3, for example, a ProductID of 2 and a quantity of 107 would return $1.49–exactly what you want. Figure 4 shows a form that uses the query. The form is shown in Continuous Forms view. Typically you would embed this form, as a subform, in another form containing customer or order information, but that data is irrelevant to my example. This denormalization isn’t the end of the world, provided that you understand why the rule exists. The danger with calculating the extended price is that the price or quantity may change without the extended value being recalculated. You could finesse this problem in a full-fledged server database by writing a trigger that recalculated the extended price whenever the price or quantity changed. However, there’s a simpler answer: Never use the extended prices field. Just because the field has to be there to make an Access user interface work, it doesn’t mean that you should count on it anywhere in your application. As you’ll see, I recalculate this field as part of displaying the form, just to make sure that the data is right. Another alternative would be to set up a temporary table, with the extended price, just to be used with this form. You’d then copy data from the “real” order details table into this temporary table to be used with the form. When the user was finished with her changes, you’d update the order details table with the data from the temporary table and then discard the extended price. Once the parameters have been assigned, the procedure opens a recordset against the query, assigns the unit price, and calculates and assigns the extended price. This is all standard data manipulation code; the magic happened in the query you’ve already looked at. And that’s it. Not an If or Select statement to be found. You’ve effectively duplicated Access’ intrinsic row fix-up functionality. If you refer back to Figure 3, you’ll see that the pricing information is duplicated for each ProductID. This is the most flexible schema, but it can result in a lot of duplicate information. The query for retrieving a price by group rather than ProductID is almost identical. This is a simple variation to the schema that can save you a lot of typing and maintenance, but notice that the two approaches aren’t mutually exclusive. 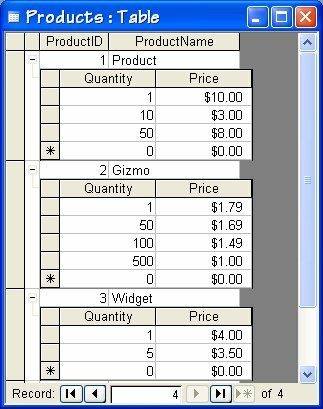 You’re not required to have more than one product in a price group, so you can easily combine both single-product and group prices in the same schema. Be careful, however, of creating artificial price groups. Just because mulberry paper and watercolor brushes happen to have the same price structure today, it doesn’t follow that they’ll stay that way forever.